Have you ever wanted to quickly check out the EPA mileage for a specific vehicle? 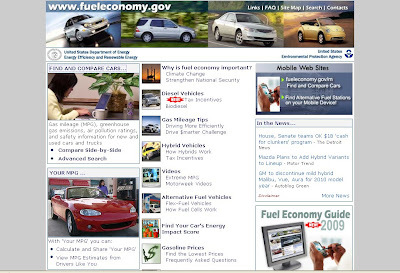 The fastest, and most sure-fire way to do so is to check out www.FuelEconomy.gov. They have a listing of all the cars that were sold in America from 1985 on up. It can be a great tool for car shopping, since you can do side-by-side comparisons. It's pretty interesting to compare some of the older vehicles to newer vehicles, too. Then again, I'm a geek like that.